According to the Treasury Department, the US public debt is now $22 trillion. 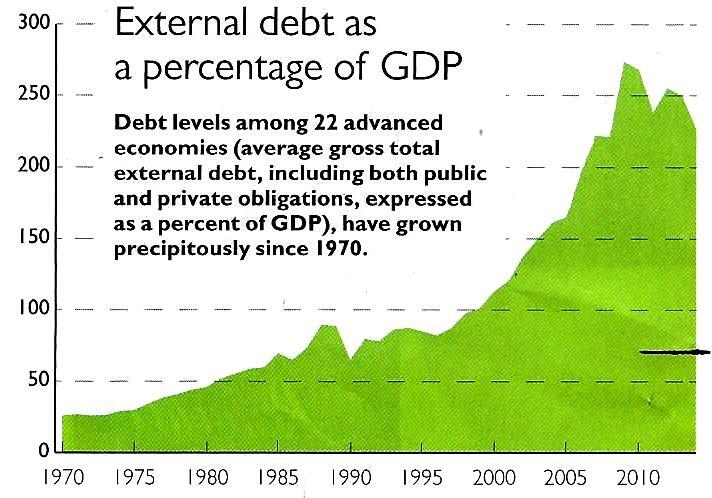 This is the highest level of debt, by any government, in all of human history. When you compare $22 trillion to $73 billion (the alleged “debt” of Puerto Rico), the US owes three hundred times (30,000%) more money than Puerto Rico. With a population of 326 million, the US government now owes $67,484 for every man, woman and child in the US. But with a population of 3.4 million, Puerto Rico owes only $21,470 for every person on the island. And so, on a per capita basis, the US is more than three times (300%) in debt than Puerto Rico. Every man, woman and child in the US has over three times more debt service and interest payments on their head, than the people of Borinquen. In other words, Uncle Sam is broke. That is why he wants YOU. Brother, can you spare a colony? Here is a 2015 study, which shows where this money is owed. As of 2015, the US owes $1.25 trillion to China and $1.15 trillion to Japan. This US debt, to just these two countries, is 30 times greater (3,000%) than the $73 billion which Puerto Rico allegedly owes to the US. In addition, we must consider public debt as a percentage of Gross Domestic Product (GDP). The Debt-to-GDP ratio is considered a key index of a nation’s economic health. With a Puerto Rico GDP of $105 billion and a debt of $73 billion, the public debt of Puerto Rico is 70% of GDP. With a US GDP of $19.39 trillion and a debt of $22 trillion, the public debt of the US is 113% of GDP. In other words, the Debt-to-GDP ratio of the US is 43% higher than that of Puerto Rico. Not only compared to the United States…but compared to the entire world, Puerto Rico’s public debt is nothing to be ashamed of. The sloppy horizontal line on the right shows where Puerto Rico’s “External debt as a percentage of GDP” falls, in relation to the other 22 “advanced” economies. As you can see, Puerto Rico’s 2015 debt level was less than one-third of the debt levels in the 22 other “advanced” economies. These economies include the US, Japan, Germany, United Kingdom, Australia, France, and Canada. In 2007, the entire US economy became so infected with poisonous debt, that the federal government stepped in and saved Wall Street with a $2,000,000,000,000 ($2 trillion) bailout. The Wall Street debt hustlers kept all the money, while millions of people lost their homes. Many of those debt hustlers – such as John Paulson, Nicholas Prouty, Salomon Brothers, Stone Lion Capital Partners – are now devouring the beaches, bridges, highways, hotels, marinas, office buildings…and soon the electrical grid and water supply of Puerto Rico. This is clearly a dangerous state of affairs. The US is both choking with debt and addicted to it. A debt-addicted society has no morals…it only has an insatiable thirst, for the virgin blood of other republics. For this reason, Puerto Rico must send a Financial Control Board to the United States: to help them manage their economy, and control their dangerous addiction to debt-and-spending. them $73 billion, send us a Financial Control Board, and pass a Jones Act. Oh wait a minute…I’m sorry, I forgot…the US already did that. Wasn’t this ‘person’ elected to decrease the American national debt? Re: Puerto Rico … ‘If we don’t send this Financial Control Board immediately, the debt-addicted US will devalue Puerto Rico’s currency by 40%, take 80% of our land, cut wages by 50%, close 200 schools and 9 hospitals, raise electricity rates by 300%, hike water rates by 60%, raise gasoline taxes twice in one year, impose an 11.5% sales tax, raise the tolls on PR-5, PR-22 and the Teodoro Moscoso Bridge, privatize our electrical system, steal our pensions, buy our beaches, imprison our leaders, accuse us of “owing” them $73 billion, send us a Financial Control Board, and pass a Jones Act. When my sister told me some time ago with shock that Puerto Rico’s debt was $72 billion I said to her “what about the United States’s debt”? I forwarded her this email. Am so glad I am back in my island. Too bad my parents brought me to the United States when I was a little girl. Sad that we were made United States citizens against our will. Sad that I had to experience racism and be called names because I was in a foreign land. A country that boasts so much about freedom and rights but is nothing but a hypocritical Bully. Am happy in my beautiful island where I should have always lived. Besides what is happening in and to Puerto Rico, the diaspora is also facing a crisis of identity and permanence. Displacement, encroachment, and gentrification are all waging their battles against Puerto Ricans. In that corner you’ll find, disappointingly, Latino, especially Puerto Rican elected officials who conspire against their own people. I’m sure there as many examples of that in cities across the US.as there are in NYC. Anyone care to identify who they are and how they either sold out or bought in (it doesn’t make a difference which, it’s .50@ apiece anyway)?